April 11, 2019: Davis entered Thursday tied for the MLB lead with seven homers. Now sitting on nine, he’s the first A's player to hit multiple homers in consecutive games since Josh Reddick did it on Aug. 9-10, 2013. It's the 12th time an A's player has done it since the team moved to Oakland. April 13, 2019: Davis hit his Major League-leading 10th homer of the season. In 2009, Davis was drafted by the Brewers (see Transactions below). 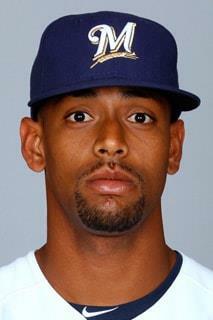 In 2012, the Baseball America Prospect Handbook rated Davis as the 29th-best prospect in the Brewers organization. They moved him up to #16 in the winter before 2013 spring training. Khris is big on preparation and staying in the game, mentally. "A lot goes into my routine," Davis said. "A lot of it's preparation, whether it's getting in early in the cage and getting some extra swings, making sure I'm staying on my workouts in the weight room. "I'm a big believer in you create your own luck. And I've gotten lucky quite a few times." In April 2013, Davis earned the final spot on the Major League bench on Opening Day, with an impressive power display during spring training, leading the Brewers with six home runs and 16 RBIs. So Khris must prove he can handle the irregular work of a bench player, but is pleased with winning a job. Davis' mother, Sonia Alarcon, routinely pitched beans to a young Khris and watched him smack them with a broomstick. Arizona is home to Davis's high school baseball career, first professional baseball game, and Spring Training for the Brewers, the team that took him in the seventh round of the 2009 draft. Davis returned to the Valley of the Sun for Spring Training as the favorite to win the starting left-field job for the Brewers in 2014, a thrilling prospect for Davis and his father, Rodney, who moved his family to Arizona in 1994 while working for the Mariners organization. "We are thankful he's a Milwaukee Brewer," the elder Davis and current member of the MLB Scouting Bureau said. "For him to be drafted by the Brewers and to be able to enjoy Spring Training as a family, we are very grateful." "Khris loves seeing family and friends at games, but he doesn't feel pressure," Rodney Davis said. "His dad and mom take care of [ticket requests]." The will to improve is a trait Khris displayed even as a youngster. "He's blessed with talent, but has worked to mine and refine his talent and continue to improve and look to get better," Rodney Davis said. Khris' drive comes from what his father calls high baseball IQ. Being the son of a former Minor Leaguer doesn't hurt, either. Rodney gave Khris three pieces of career advice. "He told me, 'Don't [tick] off the [clubhouse manager], don't [tick] off the training staff, and just have fun,'" Khris said. "But, he never had to worry about me adjusting to the Major League level." Now that Khris made it to The Show, the younger Davis is teaching the elder one a thing or two. "I'm learning things from him now," Rodney Davis said. "He has blessed me and helped my baseball development." May 2014: Davis received a death threat on Twitter. Milwaukee general manager Doug Melvin said that the threat was turned over to Major League Baseball security. He said the team was told the situation had been "handled" and didn't elaborate. Davis says he got the threat in mid-May when the Brewers were in Chicago to play the Cubs. He referred to the matter as a "distraction." Khris received a welcome distraction while stuck in his car on a Los Angeles freeway in February 2016. The outfielder's agent phoned him with news that the A's had traded for him, effectively ending his nearly eight-year tenure with the Brewers. "I was just sitting on the freeway thinking, what a great opportunity," Davis said. "I can't wait to ball out, enjoy my teammates and help the organization win ballgames. This is a great opportunity to show the world what I can do," he added. It's a Sunday afternoon, and Sonia Alarcon is nearing the end of her shift as a concessions worker at Chase Field. A voice echoes through her radio, and she must go. She'll call back within the hour, she says—and she does, with the little time she has to spare before she must clock in again, just down the street at a Rihanna concert to cap off a 12-hour work day. Come Monday, Alarcon will wake early to attend to her full-time job at Blue Cross-Blue Shield. In November 2016, she'll celebrate being with the company for 20 years, half of that time spent balancing two jobs. The second job, a part-time gig, is more demanding during baseball season. "I'm used to the hours," Alarcon said. "I can put in 80 hours a week, maybe twice a month." Alarcon's son, Khris Davis, wasn't exaggerating when he called her a "busy bee." "She works a lot," Davis said. "She knows she doesn't have to work two jobs, but she just enjoys it." "I like to take care of myself, and I don't like to bug anybody for money," Alarcon said. "I'm good." It's all she knows. Alarcon's parents moved their five children from the Mexican state of Sinaloa to Paramount, Calif., a small city in Los Angeles County, when Alarcon was 4 years old. She watched their tireless work ethic with close attention. Khris, fluent in Spanish like his mom, would do the same. The outfielder understands the curiosity surrounding his father, longtime big league scout Rodney Davis, that usually accompanies the typical line of questioning from reporters clinging to a feel-good storyline about baseball bonding father and son. Rodney's role in Khris' grooming as a baseball player was significant. But Rodney, now a senior adviser of MLB's Urban Youth Academy, also saw his scouting job take him on the road a lot, so it was Alarcon who could be found in the family's backyard in Arizona alternating between two shifts: pitching baseballs and shagging them. This was the job she loved most. "She played a big role as far as doing the dirty work, the dirty work that no one wants to do," said Khris, flashing his crooked, wry smile. "I'd do this drill where I would toss up a ball and hit it myself, and she would go out there and shag for me. Of course my chores and my homework would have to be done first." Alarcon would also throw beans to Davis, who would smack them with a broomstick. "Seems like the second I put a stick in his hand, he knew what to do with it," Alarcon said. "He picked it up really quick, and ever since then, he's just been playing ball and loving it. I would pitch to him whenever he needed. Even on a tired day, I would go out there and pitch beans and balls to him. I would just have to remind him not to hit me. He told me I would be OK, and I always was." Khris, who has two younger siblings, likens himself to his mom; both are shy and reserved. They're homebody types, but extremely restless. The field, Khris says, is his safe haven, mostly because that's where he can stay busy. At home, he immerses himself in movies and video games. Alarcon is rarely home, and even when she is, the TV is hardly on. Watching Khris' games makes her nervous, so she likes to follow his actions on her phone. "But when I do see him," she said, "it gives me a big smile. I don't know if it's even hit me yet that he's playing in the Majors," Alarcon said. "I just sit back and enjoy it. To me, he's still just my child." July 24, 2016: Ken Griffey Jr. was inducted into the Hall of Fame, commemorating an exceptional career spanning 22 seasons that earned him the highest percentage of votes in the history of players entering the Hall. Khris Davis said he had the privilege of taking in a small portion of that career up close, and took time to reflect on one of his "all-time favorite players." Davis' father, Rodney, was the Mariners' rookie-ball coach when Davis was 8 and 9 years old, and Khris worked as the Mariners' bat boy during Spring Training in Peoria, Arizona. "I would just watch A-Rod and [Griffey]," Khris said. "They would just make the game look so easy, and I just wanted to do that too. It's a pretty hard game. I respect what they did and the examples they set for me too." Griffey finished his career with 630 homers and a .284 career batting average, and also grew up around the game, overlapping his father Ken Griffey Sr.'s 19-year career. He spent 13 years with the Mariners, becoming one of the most recognizable figures in baseball. Davis said he was in awe of Griffey, adding "I made sure not to bug him." "He looked like he was just having fun a lot of the time. He looked so happy to play the game," Davis said. Davis even had a Griffey Jr. model glove as a kid. Knowing this, Griffey played a prank on Davis one day, saying Davis stole his glove from him. An incredulous Davis looked down at the glove before looking at back at Griffey, quickly realizing it was a joke. "I told him he was left-handed," Davis said with a smile, "So there's no way it could be his glove." A's hitting coach Darren Bush often tells Davis, he has a lefthanded swing in a righthander's body, comparing it to Griffey's swing. Khris is shy and prefers to be alone when he's away from the field, rather than immerse himself in large groups of people. He's spiritual but not religious, though Bible stories were his favorite as a child. Davis only spoke Spanish until he reached elementary school—but he now enjoys enriching self-improvement books. "What are you going to do if you're not learning," Khris says he regularly asks himself. He also writes, taking a journal with him most places, rather than tapping away on a smartphone or iPad. "If I come across a good quote, or some weird coincidence happens during the day, I like to not forget and write it down." In December 2016, Davis said that he would play for Mexico in the World Baseball Classic in March 2017. Khris was also on a preliminary list for Team USA, and he’d been weighing which country to play for. February 19, 2017: Davis had to bow out of the World Baseball Classic, forgoing his invitation from Team Mexico in order to focus his energy on preparing for his second season in Oakland. IN HIS OWN WORDS: My name is Khris Davis. I'm an outfielder for the Oakland A's, and for me, it all starts with my parents. They are my role models, and they taught me that hard work pays off. They also showed me that happiness is important and is worth pursuing. Mom was always there to take me to my games, and even if I didn't want to play that day, she would hold me accountable to show up for my teammates. She was willing to throw batting practice to me when I was little and think outside of the box by pitching beans to me. I would just hit those beans with a stick for hours and hours. She showed me how to work. Even now, she has a full-time job and then does other part-time jobs, because that's just who she is. You can still find her working concessions at Chase Field sometimes. Dad was a big league scout and an amazing coach. I got to see a lot of players, meet a lot of superstars at an early age, and what I remember the most is him teaching me to watch how they did it. I learned a lot by watching Ken Griffey Jr., who was like this mythical Greek god to everybody, and A-Rod, who had this swing that was just so smooth for a righty. Nomar Garciaparra was a grinder, a tough guy, and someone I could relate to. He also did a lot of little things in his routine when he was at the plate that were a bit different. I can get weird about my routine and my moves, too. I think just being locked in, you forget that everybody's around you, watching you, and you do all these things that might look crazy from the outside, but I don't even know I'm doing it. I definitely need to be focused to succeed. I've heard people describe it as me going "dark" or "monster," but it's just me being locked in. It takes a lot of breathing practice to get to that point and just a willingness to surrender and not worry about results, because that's where a lot of doubt comes from. It's about attitude and willpower and quieting the distractions to get to that place. I train at a boxing gym because I can get locked in there, and there are a lot of similarities between the sports. A pitcher and a hitter against each other is almost like a boxing match. IN HIS OWN WORDS: My manager Bob Melvin is a weird, fun NorCal, Bay Area person. He loves it up here. I think when it comes to handling our clubhouse, everybody respects what he has to say, and we have to go out there and play hard for him. He expects us to play the game the right way. What more can you ask for in a manager? I've loved Oakland since Day 1. There's lot of history here, and I can tell you firsthand there is a lot is going on and a lot more than meets the eye. It's a fun and eclectic place, but it's a really humble city at heart. It's complex and I think I'm complex, but at the same time, we are all trying to just keep it easy, laid back and trying to be cool in any situation. It's hard-working and a little under the radar, which is fine, too. We know who we are here. This is a very interesting fan base, too. They've always got my back. And to the Coliseum drummers out there each game—there's more than one—I want them to know I enjoy them thoroughly. I think it puts pressure on the other team and it helps me focus. The beat of the drum and the music just helps. It always has. That's because music is part of my everyday life and I depend on it. There's a special place in my heart for music, and it just distracts my brain from results, good or bad. Every failure I've ever had, I've depended on music to take the pain away. Tupac, Kendrick Lamar and J. Cole are probably my favorites right now. I also have this tattoo on my back, a stealth bomber, that helps keep me in a good place. I know people see it and think it's about me being under the radar and hitting a bunch of bombs. It's actually a tribute to my uncle, an artist who had this mural on his wall, and I just loved it as a kid. It's the one tattoo that takes me back to my "kid place," and allows me to think back to the fun times I had with my uncle and family. Those memories help me focus on what's important. I think it would help anybody to just be able to go to that "kid place," the time when you are 12 years old and happy without all of the distractions. I believe finding that place and staying young is the key to living life. Khris wanted an autograph for himself. And Anthony Slocumb was just beside himself to make it happen for his favorite baseball player. The newfound friends swapped blue ink, then Davis, still sporting it on the back of his jersey in game action against the Rangers that night, went out and hit a moonshot of a home run in the A's resounding 9-0 victory. Slocumb was visiting the Coliseum with a group from the Make-A-Wish Foundation's Greater Bay Area chapter, watched on. The 10-year-old is in remission from a rare cancer called Langerhans cell histiocytosis. "There was a lot of emotion," Davis said. "I just wanted to put a smile on his face and thought maybe it would mean something if I had my jersey signed by him, just to know what that feels like to be in my shoes for a split second. "I thought about him around the bases. There's not a better feeling than hitting a home run, so hopefully he got some excitement and joy from watching that." Davis, buoyed by the short but sweet encounter, carried Slocumb with him into the night. A wardrobe change was out of the question. June 2009: Davis was drafted by the Brewers in the 7th round, out of Cal State-Fullerton, signing with scout Josh Belovsky. Feb 5, 2017: Davis won his arbitration case with the A's, earning $5 million in 2017. Jan 11, 2019: Davis and the A's avoided arbitration, agreeing on a one-year deal for $16.5 million. Davis uses bat speed to drive the ball to all fields. But he has some holes in his long righthanded stroke and may not hit for a high batting average in the Majors. He hits his homers to all fields. It is mighty power, earning him the nickname, "Khrush Davis." Khris studies pitchers. He already has a plan before he goes to the plate for an at-bat. He is prepared and is becoming more and more polished at the late. He gets himself into hitter's counts and exhibits a very good eye at the plate. He will take a walk when he is pitched around. Davis is a streaky hitter. But he doesn't get himself out as often as he did early in his pro career. After Khris's first Major League hit on April 6, 2013, Brewers pitcher Kyle Lohse had a little fun with the milestone night for the rookie outfielder. Davis slid into the tarp for a terrific inning-ending catch to end the top of the second before logging his first Major League hit in the bottom of the frame, a double to right-center off D-backs lefthander Patrick Corbin. After the game, Lohse presented Davis with the baseball as a memento. He even inscribed it, only Lohse misspelled Davis's first name ("Chris"), included the wrong date, and generally wrote with a first grader's penmanship. "It had me for a while," Davis said. Longtime clubhouse manager Tony Migliaccio came to the rescue with the real ball, already set in a display case labeled with the milestone and the correct date. Davis planned to give it to his mother. "I kind of knew it was going to happen in that AB," he said of the hit. "Sometimes you just know. I made that sliding catch and then I was coming up that inning, so I was like, OK."
Davis endeavors to have a good approach in every single at-bat. "Less is more with me," Khris said in 2013. "My (Nashville) hitting coach [Bob] Skube and I were talking about that as a game plan. If there is a secret, I'd just say it's positive thinking: 'I'm going to go up and get the job done' rather than 'I can.'" In April 2013, after starting the season with the Brewers, Davis got off to a slow start at Nashville. "It was more the mental side, I don't think anything was wrong with my swing," Davis said. "Just coming down from the big leagues was an adjustment as far as confidence and getting back into the swing of things. I had a different role up there and down here." Khris is the type of hitter who can have success coming of the bench to pinch-hit or be a DH. "He's not a guy that you worry about too much, about him being too nervous or two amped up. He's got a pretty good idea. When you talk to him before he goes to hit, he's thinking and trying to come up with a plan. I think his temperament fits pinch-hitting, fits the occasional starting. It's a good mentality to have," Brewers manager Ron Roenicke said. "He can really, really swing the bat," Brewers outfield coach John Shelby said during 2014 spring training. "He's got a lot of power for his size." Davis is well known for hitting the ball hard. "He's always hit for power. The potential is there for a 20-30-home run hitter," Shelby said. "[Khris] has a really good swing, very talented and has really good hands," Jonathan Lucroy said. "With a guy like that, you can't sit him on the bench, you've got to let him hit." In May 2014, the mechanical adjustment behind Davis's surge at the plate was minor in nature, but it has made a big difference. It was a matter of eliminating some trouble with his timing. "I've just been getting set up on time and trusting my hands," he said shortly before he started a game in the five-hole for the first time since May 5. "Earlier in the year, I felt like I was catching stuff out in front, which makes me pull-happy. I'm never working to pull as a hitter. As far as my timing, I've been catching [the baseball] deeper." The result is better power to right field. "My whole life, I've always used the opposite field," he said. "We talked about it a lot," Brewers manager Ron Roenicke said. "He has made some changes, and I can see it and the results are great. Any time you have a guy change a little bit and you see results, it's always nice because then they feel like somebody is helping them, and when things go bad again, they'll be more apt to listen." He's feeling more confident at the plate. "It's more of a mentality thing as far as confidence-wise," Davis said. "Like I said, I just found something I believe in, and I'm going to hold onto it as long as it works. It was only a matter of time before I found something in my swing. It's a roller coaster of a ride when you go through those struggles, but it feels comfortable now." Aug. 29, 2015: Davis became the first player in baseball history to hit 14 or fewer home runs in a season while logging four multi-homer games. Khris joined a list of some of the greatest power hitters in Brewers history by belting his 10th August home run. It marked the 26th month of 10-plus homers in Brewers history, and the first since Prince Fielder hit 10 home runs in June 2011. Fielder also holds the franchise record for home runs in a month, with 13 in May 2007, on his way to hitting 50 that season. In 2015, Khris increased his slugging percentage on contact against fastballs by nearly 300 points (from .691). Nobody, not even born-again power hitter Matt Carpenter, improved the damage on fastballs more than Khris. He had the single largest increase in slugging against fastballs, and it catapulted him into some elite company: 1. Chris Davis .959; 2. Khris Davis .949; 3. Bryce Harper .903; 4. Mike Trout .890. So what changed? It's hard to say. It could just be that he sold out a bit for more power. His contact rate dipped and his strikeout rate jumped, but so did the power. Maybe he's going all in. But "selling out" for power implies a negative connotation, and I don't think that's at all the case, because despite the added strikeouts, Davis improved his power and his on-base ability in 2015. It's the best pair of improvements you could hope for from any hitter, and in Davis' case, it seemingly all stems from pitch recognition. Davis' walk rate nearly doubled, and last year it ranked in the upper 25 percent of all hitters. He used to be the all-or-nothing slugger who doesn't take a walk, and pushing in all the chips for one skill is a risky proposition. Think of the walks like a safety net. Now, on the days when the thump isn't there, Davis can still make himself useful by getting on base. With the walks, he is a more well-rounded hitter. September 18, 2016: With two homers, Davis became the first A's player to hit 40 homers since 2000. 2016 season: Acquired from Milwaukee in February, Davis made himself right at home in Oakland, greeting the American League with 42 home runs and 102 RBIs—both career highs. In doing so, Davis became just the fifth player in Oakland history to reach the 40-homer mark, joining the likes of Jose Canseco, Jason Giambi, Reggie Jackson and Mark McGwire. Derek Jeter wasn't the first player with an inside-out swing, but he may as well have patented it over 20 years in the Bronx, during which he made it cool to stay in the strike zone, to single somewhat softly, to spray. Nearly 70 percent of Jeter's 3,465 hits went to center or right field, and like so many Y2K kids, Khris Davis was watching. The A's slugger was 13 when the 2001 World Series brought Jeter, at the height of his celebrity and skills, near his Arizona home. Sometime that autumn between "The Flip" and Byung-Hyun Kim, Davis found the player he wanted to model himself after. "I thought he was the G.O.A.T. [greatest of all-time]," said Davis, who wears No. 2 to honor Jeter. "I rather hit an inside pitch oppo than turn on it. I was watching Derek Jeter a lot during that time." Such sparked the swing inspiration for a kid who'd grow into baseball's most productive opposite-field hitter. Davis' swing is more an offshoot of Jeter's than an evolution from it, less efficient and more laborious, and nobody would confuse the two today. But the root of what makes Davis unique at the plate—his ability to hit any pitch for a home run to any field—comes, maybe curiously, inspired by Jeter's slasher style. And it's allowed the 29-year-old to corner the market on of the most difficult parts of hitting—sending inside pitches to the opposite field with authority. "There aren't many righties who can hit the ball out to right field like a lefthanded hitter does," A's manager Bob Melvin said. "We get spoiled by it a little bit." Soft, hard, in or out, Davis tries to hit everything that way. He's strong enough to crush hanging breaking balls and hook outside heaters over the wall to his pull side. But when he's going right, Davis is driving the ball, more than any other hitter, to center or right-center. Khris will work with single-hand bats in the cage to help him stay inside the baseball (a drill he heard Jeter used to do). Then he spends most of his on-field pregame swings shooting oppo. (Most players take just one opposite-field round.) The practice has translated into some of the A's most memorable home runs this season. "To see a guy who takes inside fastballs middle-in and hit them out the opposite field, especially in Oakland, and do it consistently, that's incredible," said outfielder Matt Joyce. "'You're a freak,' I joked with him the other day. 'How does it feel like to be a freak?'" The physics that allow Davis to drive the ball the way he does are fueled by his strength and rooted in his mechanics. Davis starts his hands low and tries to spit on anything above them. He stands far from the plate then instinctually steps away from it, clearing his hips for a bat angled toward right-center. His bat enters the zone early and drags behind his body, producing power in conjunction with a lower half that teammates compare to a bodybuilder's. "He's incredibly strong, but he's incredibly flexible as well. It doesn't look like a muscular swing. It's loose, relaxed and very whippy," said Joyce. "I don't know if you can teach it. There's so much of me that wants to be able to do what he does. But it's a swing that you either have or you don't. And he has it." It's a swing engineered to punish pitches down and put baseballs in the seats. But it has holes. More than half of Davis' plate appearances this season have ended in either a strikeout, a home run or a walk, making him, in terms of production, about as opposite an inside-out-hitter to Jeter as can be. But it's the approach that allows his swing to work, and that keeps Davis in a unique kinship with his childhood idol. September 10, 2017: Davis accomplished something that hasn’t been done by an A’s player in over a decade. He surpassed the 100-RBI mark for the second consecutive season. Sept 1, 2018: Davis notched home run No. 40, and in doing so joined Hall of Famer Jimmie Foxx as the only two players in A's history with three consecutive 40-homer seasons. "Pretty amazing," A's manager Bob Melvin said after an 8-7 loss to Seattle. "He's been stuck on 39 for a little bit. I think that happened maybe the first year or two. Now he's past it. "It's just miraculous numbers that he puts up. We've had a long history of power hitters here, and to be with Jimmie Foxx and that kind of company, and we're still looking at close to a month left, he's been as consistent a power hitter as anybody who's been in Oakland." 2018 season: Davis' season average was .247 for a fourth straight year. Just how unique is this statistical oddity? He's the first qualified batter to have the same average in four consecutive seasons. In 2018, Davis won the Edgar Martinez Outstanding Designated Hitter Award. He became the third player in franchise history to earn the prestigious award, joining Dave Parker (1989) and Dave Kingman (1984). April 10, 2019: Khris made some history by hitting his 200th career homer, but he was not making a big deal about it. “It’s just a number,” he said. The two-homer night for Davis was the 23rd time in his career that he hit more than one in a game. He sent both blasts to right-center field, with a two-run shot in the fifth and a solo homer two innings later. The latter was No. 200. As of the start of the 2019 season, Khris's career Major League stats were: .248 batting average, 193 home runs and 676 hits with 497 RBI in 2,726 at-bats. Khris is not a very good defensive outfielder. He makes the routine plays, but is limited to left field because of a below average arm. He has trouble reading the ball off the bat, so he doesn't get a good jump on the ball. And he is a below average runner, so his range is not even average. Khris is a below average runner. May 6-June 4, 2012: Davis was on the D.L. with a strained right calf. June 6-July 9, 2012: Khris was back on the D.L. after reinjuring his calf—he had returned too soon. May 30-July 7, 2015: Davis was on the D.L. after taking an awkward swing and striking out in the first inning of a Brewer loss. He required surgery to repair a torn meniscus in his right knee. June 2, 2015: Khris will be sidelined 4-6 weeks after undergoing surgery to remove torn cartilage from his right knee. Dr. William Raasch, the Brewers' head physician, performed the surgery and opted to debride, or cut away, a portion of Davis's meniscus. Feb 23, 2019: Davis, who has yet to make his spring debut, is dealing with a mild left calf strain, manager Bob Melvin revealed. He is considered day-to-day. Melvin said Davis has been bothered by the issue “off and on since camp started” and recently shut down all baseball activity.